Cats rule in North America – 30% of households purchase cat litter for an estimated 73 million felines, compared to 63 million puppy chow homes. A group of cats is called a clowder, the technical term for a cat’s hairball is bezoar. Apparently cats can make about 100 different sounds compared to 10 from a dog. Most female cats are right pawed, males favour their left. Approximately 40,000 people are bitten by cats in America each year. During that year, roughly 4 million felines are eaten in Asia. It would take 24 cat skins to make a coat. Cats sleep 2/3 of every day, a nine year old cat has only been conscious for 3 life years. There are an estimated 60 million feral cats in the U.S. In 1963 French cat Felicette, dubbed “Astrocat”, was the first cat in space. Historically, evidence of the first domesticated cat comes from a 9,500 year old grave on the island of Cyprus where feline bones were unearthed beside human remains. Ancient Egypt worshiped cats, smuggling them out of Egypt was punishable by death. When a family cat died Egyptians would mourn by shaving off their eyebrows, followed by an elaborate funeral feast and placing mummified felines in the family tomb (complete with tiny mummified mice ). In 1888 over 300,000 mummified cats were discovered in an ancient cemetery – according to RandomHistory (linked below) they were “unwrapped” and sent abroad to be used as fertilizer by farmers in England and America. ( don’t despair – I agree this needs a fact check assignment ). Christianity wasn’t kind to cats. During the Spanish Inquisition Pope Innocent VIII oversaw the incineration of countless evil felines ( really bad decision – bye, bye pest control, hello black death ). At the midsummer festival of St. John’s Day, towns across medieval Christian Europe gathered at bonfires to burn live cats. Associated with witchcraft and the devil, people shrieked with delight as bags of live cats roasted in flaming agony. 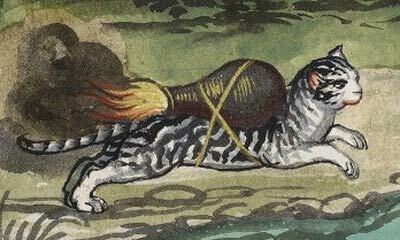 It’s possible “cat burning” inspired Franz Helm to detail rocket cats in a 1590 manual on siege warfare. ‘Create a small sack like a fire-arrow … if you would like to get at a town or castle, seek to obtain a cat from that place.